Create a “Secret” Barbecue Sauce Recipe With Dad This Father’s Day! If your Dad is the master of the grill, then a barbecue style Father’s Day is in order! 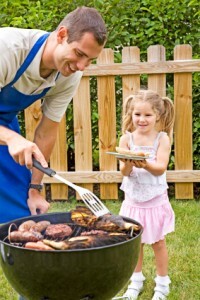 Most of the Dads we know love to command the grill (even if Mom secretly does it a little better!). Celebrate with Dad by making your new favorite barbecue sauce together – give it a fun name, and it’ll be forever known as the barbecue sauce that only you and Dad can expertly create. Here are some recipes to get you started, and remember to order your Dad’s Blue Ribbon BBQ Father’s Day Gift Basket, filled with so-good sauces, rubs, and seasonings to complement your bbq sauce, along with tasty Dad-themed treats in the rest of our Father’s Day gift baskets! Directions: Mix everything together except the soy, butter, and smoke. Simmer for 30 minutes, and then stir in remaining ingredients and simmer for 10 more minutes. Directions: Blend all of the ingredients together in a saucepan over low heat. Begin stirring occasionally, and simmer for 20 minutes. The sauce should be thin. Allow the sauce to cool, and store in an airtight container in the refrigerator, and allow to sit for one day. Directions: Mix everything together and simmer on low heat for about 30 minutes. This sauce is delicious, but particularly tastes great with pork. Want to vary up the recipe? Go ahead! Ingredients like brown sugar, chili powder, paprika, honey, cayenne pepper, onion powder, yellow mustard, and ketchup all work beautifully in barbecue sauces, so feel free to experiment! Then, cook up some barbecue, get the family together for one amazing cookout, and gift Dad with his Father’s Day Gift Basket. Oh, and prepare to be buying custom jar labels in the near future, as we have a feeling you’ll be getting some order requests for you and Dad’s secret barbecue sauce!